Season's Grettings to all of you! This watch was a present to my father from my mother; from the backcase I guess it is a 1971 production and I searched anywhere to understand which model but never found anything matching. For further information, as you will see it is made in solid 18k satin gold and very heavy (more than 3.5oz.). The closest I can come up with is this advert. Wow, that's a nice one. Congrats, that's a pretty respectable heirloom watch to receive from your Dad. I come up empty on a name as well. 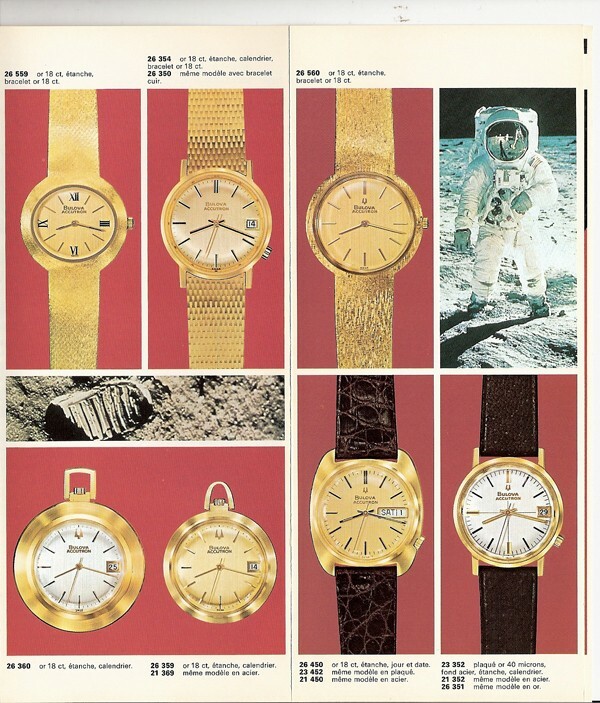 1971 Bulova Accutron is the best I can do, but still looking. If you can once again find the link, we would be very pleased if you would share it. What a lovely heirloom for you to have from your parents and a beautiful watch. The ads and names diminish in the 70's but at least you know it is an Accutron. I agree with Stephen that it is probably a Mini Accutron. Good point. I missed the part 'to my father from my mother' which would mean its a mens watch. gioodel can you please measure the width of the watch (minus the crown) and post here. Could it have been a gift to your mother from your father ?